Figure 1:Top Down view of identical channels milled in 2 different scales. A. 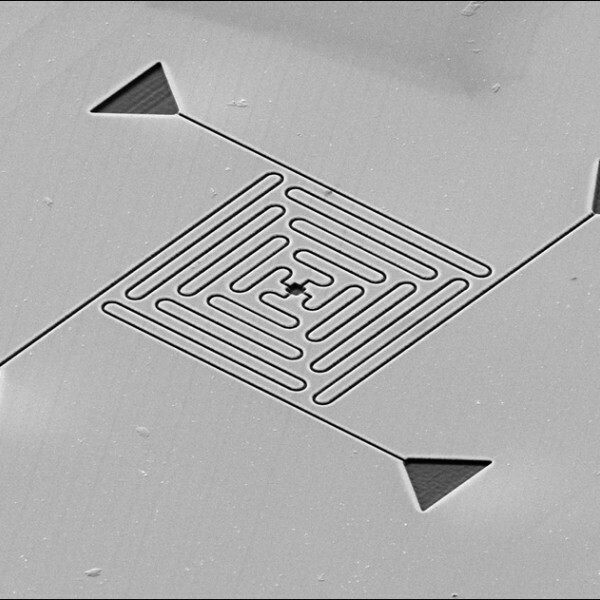 A 850 micron long channel of 2 micron width milled using a 6.5 nA beam. B. 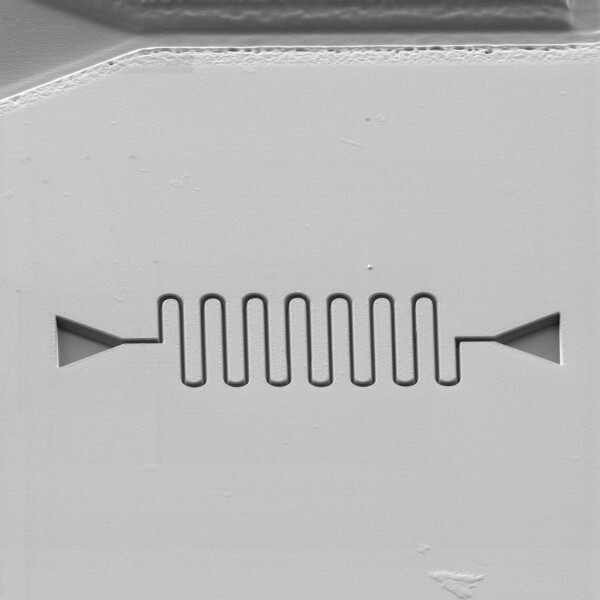 A 80 micron long channel of 100 nm width patterned used a 150 pA beam. Figure 2:Isoview of the smaller channel. The linear length of this channel is 80 microns and the width of the channels is around 100 nm. Figure 3:Isoview of spiral type channel and a sinusoidale channel. Patterned with a 150 pA beam. 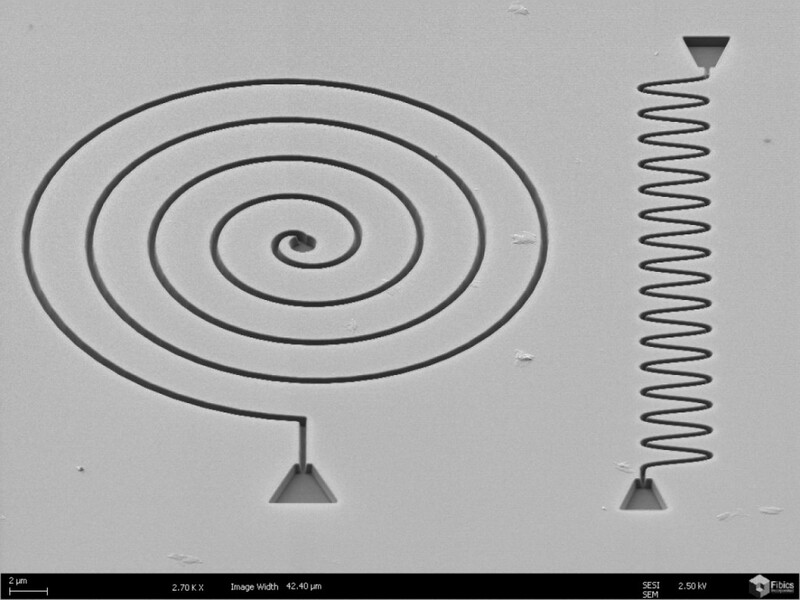 Figure 4:Isoview of a 4 channel microfluidics system patterned using a focused ion beam. The NPVE (Nanopatterning and Visualization Engine) was used to pattern the device. Fluids constrained into micrometer scale structures behave differently than fluids flowing into a macro-scale environment, like water into a copper pipe. 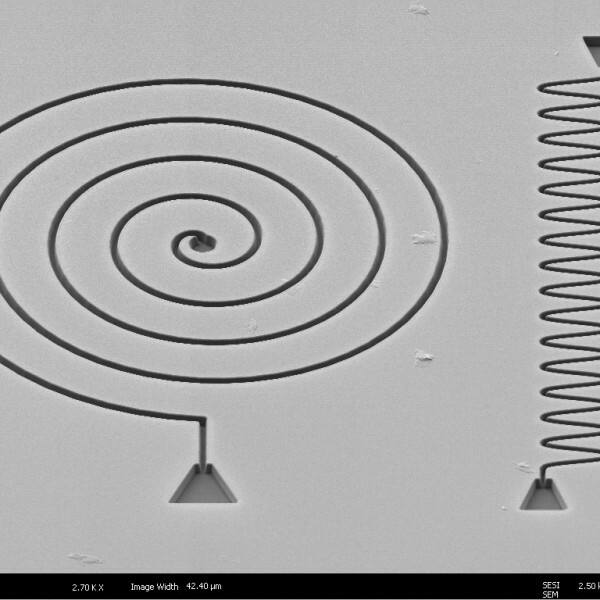 Microfluidics, with applications in transportation, energy and medical fields will have considerable impact on society. For this reason, having a means to rapidly prototype designs is key to lower production cost and to substantially increase productivity in the R&D phase of development. 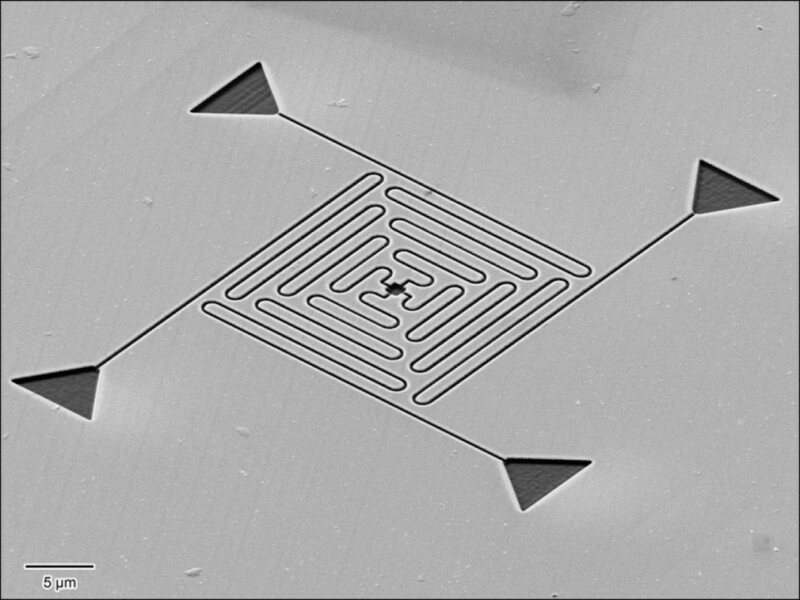 This application note will show the benefits of using focused ion beam (FIB) to produce microfluidics and nanofluidics channels with the Cross-Beam system equipped with a NanoPatterning and Visualization Engine (NPVE) system. First, draw the channels prototype in a format that can be imported into the patterning engine. The NPVE offers great drawing capabilities, but it is also possible to use AutoCAD® or Adobe Illustrator® to draw the prototypes and then import them into the NPVE software as DXF files. Once imported into the NPVE, select the patterning parameters such as beam current, patterning direction and dwell time. 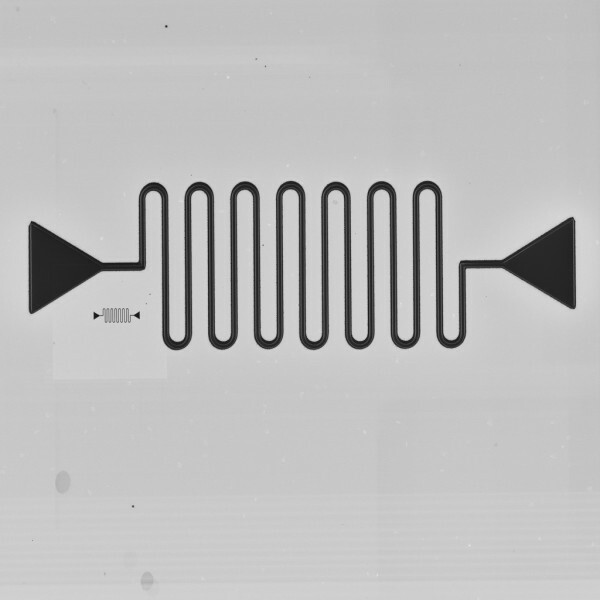 Prototypes can be scaled and machined with extreme precision provided the FIB probe current is varied accordingly: channels of several microns in size can be milled using the biggest beam current and channels in the 100-nm range, or smaller channels can be cut using the smaller FIB probes. The time taken to mill the channels remains in the same range since the probe current is scaled proportionally to the amount of material removed.